Marco Rubio's presidential campaign and those close to the Florida senator are engaged in deep conversations about the future of his presidential bid. The topic of dropping out before next Tuesday's Florida primary has been raised and was not summarily dismissed. It is an option being weighed, but it is unknown how seriously. That it is even on the table speaks to the depth of existential angst within Rubio's camp after a night of demoralizing setbacks in Michigan, Mississippi and Idaho. Rubio did not qualify for a delegate in any of these states and registered only 9 percent in Michigan and 5 percent in Mississippi. A‎mong the questions Rubio advisers debated somberly after Tuesday's results was what effect his poor showings would have in his home state of Florida. Another prominent question: how would a loss in Florida next Tuesday affect Rubio's long-term political future, including a possible run for governor in 2018? It was unclear if Rubio was personally considering quitting, but advisers say his entire inner circle was forced into some tough conversations about the path forward and whether to continue. Rubio's struggles could also re-ignite speculation about an alliance with Ted Cruz that would carry a Rubio endorsement, thereby consolidating the anti-Trump vote behind Cruz. Alex Conant, a senior strategist for the Rubio campaign, vehemently denied any conversations about quitting the race before Florida. He said anyone who was surprised by ‎Tuesday's poor showing "was not paying attention" and that no one advising Rubio has ever suggested he drop out before next Tuesday. 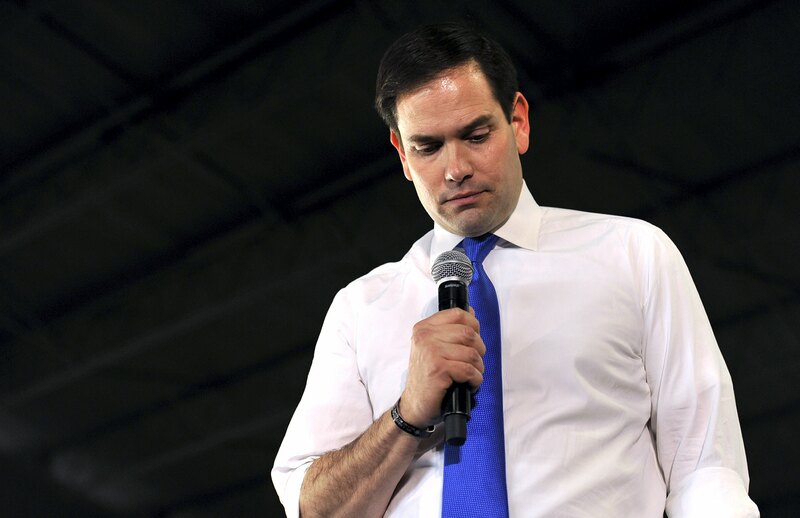 ‎"Marco is only candidate who can beat Trump there -- especially when you consider all the early votes already cast," Conant said, adding it was time for everyone on team Rubio "to buckle up."